Though a fan of electronic music since its inception, the guitar had been the instrument of choice for musician and writer John Patterson. 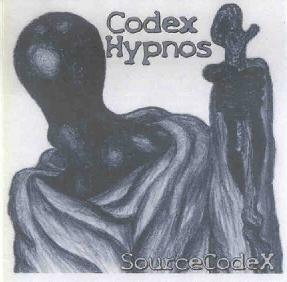 But in 2002 he began experimenting with software-based synths and sound editing programs, the result being the new SourceCodeX CD entitled "Codex Hypnos". I may write a great deal about electronic music, but I'm fairly clueless about the technology that goes into creating it. So it blows my mind to hear something that sounds as beautiful as the music on Codex Hypnos and realize that it was created completely on John's computer without the use of external hardware. So it sounds good... how is the music? John has created an absorbing 78 minutes of ambient space pieces. He's not doing anything different from his peers in the genre. But the challenge with this style of music is being able to construct the pieces such that they evolve... seeming to take on an organic life of their own. In this regard it's not surprising that the longer tracks are the strongest. Ambient music needs lots of room to grow. "HALsleep" was a track that was really sucking me in, but after a mere 4 minutes I felt like it was cut off before it could reach it's compositional puberty, nevermind maturation. "DreamingHyperSleepDawn" isn't much longer, but does a better job of making its statement and bringing things to a natural close. But with the 16 minute "Dark Star Voids" we really take off on a voyage. The track opens with dark drones and swirling waves that have an almost melodic quality that adds character and intensity to a landscape that is just as haunting as it is cosmic. I got a real sense of thematic development and could easily see this as the backdrop for the sci fi flick scene in which the ship has lost all power and is now just floating aimlessly through space. Very image inducing stuff indeed. And John keeps the music interesting by gradually and subtly changing course and presenting the listener with a continually evolving vantage point. Ditto for "Arrival And Fly-By", which is also one of the most sonically varied tracks of the set. "Nazgul Caves" is another strong lengthy track that explores different realms, sounding like a representation of the surface of a stormy windswept desolate planet. You can really FEEL the howling winds blasting non-stop across what is clearly alien inhabited terrain. This might be my favorite track. Overall I have to say there is some top notch space-ambient and soundscape music to be heard on this set. Bring along a little imagination and John will do the rest. For more information you can visit the SourceCodeX web site at: http://sourcecodex.eer-music.com. Sound files available at: http://www.soundclick.com/sourcecodex. Contact via snail mail c/o John W. Patterson; PO Box 1797; Wake Forest, NC 27588-1797. John also hosts the Yahoo Ambient Space music group. You can join the discussions by visiting: http://groups.yahoo.com/group/ambientspacemusicinfodump.